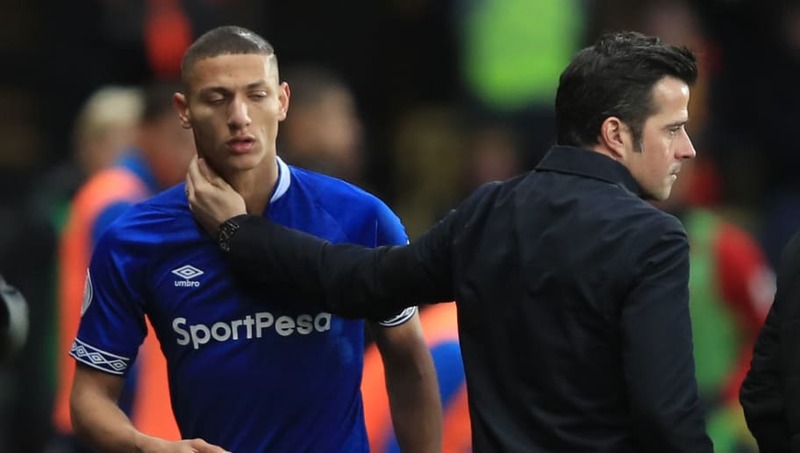 Everton forward Richarlison has revealed he has a huge amount of trust and respect for manager Marco Silva and says he believes they will work together frequently during their careers. The Brazilian burst onto the scene with Watford in 2017 and contributed five goals in his debut season in the Premier League. Silva was integral in Richarlison's decision to join Watford, the forward citing the manager's ability to speak Portuguese as an instrumental factor in his move to England. The relationship between the two strengthened further when Silva signed Richarlison for Everton in 2018, a deal reported to be worth around £50m. Speaking this week whilst away on international duty and quoted by ​Globo Esporte, the 21-year-old reaffirmed his loyalty to Silva. He said: “For me, he was very important in my arrival. Even for being Portuguese, and I understand his speech. "Because you often get there, find an English coach, and we don’t know English yet. So that helped me a lot in the adaptation." He added: "I’m a trustworthy guy, wherever he goes, I think he’ll take me. He trusts me, and I trust him. From the first call he made, when I was in Rio still. This relationship is very important." ​Everton have had an average season so far, currently sitting in 11th place with seven games to play. ​Richarlison has contributed 13 goals in 32 appearances in all competitions and will be looking to take his form into a Brazil side who will be without ​Neymar for the upcoming fixtures.